If anyone was to mention diving in Thailand to you, then you would most likely think of one of the west coast destinations. Hardly a thought would be given to the small island of Koh Tao, which lies off the east coast in the Gulf of Thailand. I live and dive here, so I find this lack of attention a little unfair. Yet, it’s hardly surprising, as it’s largely overlooked by dive travel specialists, and for the most part, dismissed as nothing more than a diver training centre. This apparent lack of appreciation is even more surprising when one considers that the two coasts of Thailand are seasonally almost opposite. When the Similans and Surins are closed and weather plays havoc with conditions at other west coast locations, the east coast is bathed in brilliant sunshine, reflecting off seas the color of that well known blue-bottled gin brand. So, which is best? This is an explosive debate for those who haunt the Internet forums. Living here, I’m probably not objective enough to answer it. What I will say is that they are simply different. So, let’s get this on the table straight away. The island is home to around 40 dive centers and is a diving hot spot for those looking to learn anything dive related. It’s probably one of the few places in the world where you can go to take training in any language with any of the major agencies to any level. It’s all here, within walking distance, which makes it similar to a university town for divers only. Surely, this should not preclude Koh Tao from being a dive destination, too? I arrived here many years ago to join the scuba fraternity, and I love the diving today as much as I did then. I saw my first whale shark here gliding around Southwest Pinnacle—a truly awesome experience. I’ve enjoyed many such encounters here since. The individuals that pass by are usually around four to five meters in length and hardly ever more than two at a time. Koh Tao is not the seeing-spots-before-the-eyes-splash-fest for which other dive locations are famed, but it is one of the few places in the world where you might see these leviathans soar past you underwater. Southwest and Chumphon Pinnacle are the deepest sites here and are home to the frenetic reef life activity that you would expect of any open ocean site. Huge malabar groupers rest languidly at cleaning stations and seem as reluctant to vacate as any armchair aficionado. Schools of pick handle, chevron and yellow-tailed barracuda twist past, fusiliers whirl in a yellow pulsing mass, and jack fish and mackerel stalk the unwary. Batfish shimmer in the current and anemones and their pink inhabitants carpet the pinnacle. What’s not to like? The two sites differ in their topography. Chumphon Pinnacle reminds me of Table Mountain in Cape Town, South Africa, whereas Southwest Pinnacle is a more typical pointy mountain shape. Like the majority of underwater formations here, they consist of boulders of varying shapes and sizes. The island’s coastline is made from the same rugged material, which juts, overhangs and leans, making for interesting formations. Underwater, it is more so, creating swim-throughs, majestic pinnacles and plenty of hiding spots for their inhabitants. The coral reef has grown up and around the boulders, creating pinnacles full of life with coral beds spanning in between. Coral is mainly of the hard type, and I think that this is one thing that makes Koh Tao different. There are a myriad of different varieties here and some amazing hard coral gardens. Fantastic specimens of staghorn, brain, table, lettuce, knobby, porities, mushroom and slipper coral can all be seen in some great formations making an interesting and varied backdrop. No matter how breathtaking the coral texture and formations are, it is all the same colour. Is this another reason that Koh Tao could seem lackluster when compared with saturated images of colorful soft coral in other locations? However, splashes of color are added by barrel sponges, with their segmented worms feeding on that which the sponge filters out, and Christmas tree worms adorn coral everywhere in glorious blues, yellows, reds, pinks, greens and variegated, adding a rainbow to the reef. I never tire of watching them hide and slowly emerge. In addition, butterflyfish, parrotfish, angelfish and luminescent moon wrasse are conspicuous against the muted color of the hard coral reef. 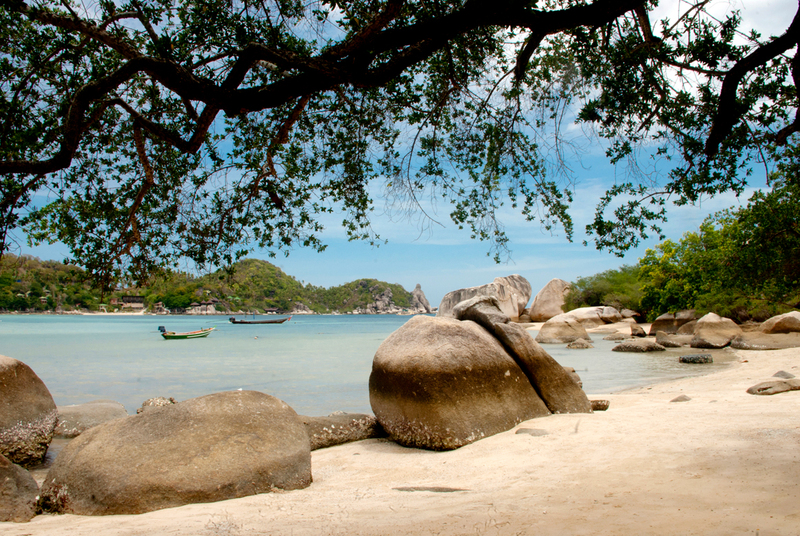 Koh Tao actually means ‘turtle island’. It was named for its appearance; from a certain approach, it does indeed look like a turtle. It’s simply coincidence that both the shiny polished green turtle and its somewhat unkempt looking cousin, the hawksbill, choose to hang out here. Similarly, Shark Island—a small island and dive site that lies to the south—was named for its fin-like shape rather than its inhabitants. This is a great place to find polka-dot nudibranch and one of the only places you will see Weibels butterflyfish schooling. Koh Tao legend has it that one of the first divers to explore the sites around the island was Italian, which is why we have sites called Red Rock, White Rock and Green Rock. Whether there’s truth to this anecdote, I don’t know, but it makes for a nice story. Red Rock and White Rock sit just off the coast of Koh Nangyuan, which is actually a couple of small islands joined by a sandbar off the northwest coast of Koh Tao. Red Rock marks the drop-off point for the gentle dive along the coast into Japanese Gardens. This coastline is home to the pink-tailed triggerfish -- a much shyer specimen than its much larger cousin, the infamous titan triggerfish. The titan trigger is the largest in the triggerfish family and is famed the underwater world over for its defensive tactics. While titans can be seen or avoided at most sites here, Green Rock is the best place to see their slightly smaller and more passive yellow margin cousin. The sands around the rock are dotted with pits, but do take care, as there are titans around, too. Green Rock itself is great fun for those who love a good swim-through. It’s like a like a block of Swiss cheese, riddled with passages and crooked overhangs—a great place to spot wart slugs and banded sea crates as well. White Rock is certainly worth several dive trips and definitely one at night. Its randomly heaped boulders and expansive coral gardens teem with life. Turtles frequent the site, and the eagle-eyed will have fun spotting scorpion fish and nudibranch.